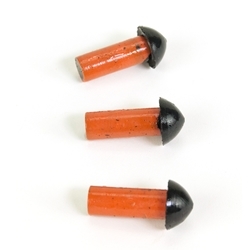 7/16 inch Mushroom Style Orange Tire Plug Insert BOWES TR 37212 Box of 15. These inserts are designed to “fill the injury” in passenger or truck, radial or bias-ply tires. While TR-12234 and TR-12239 are temporary repairs sealing by compression only, TR-37211 and TR-37212 are coated with a special orange vulcanizing gum to ensure a fully vulcanized repair either chemically or in a heat curing system.